On Wednesday 19th April we were delighted to welcome the Mayor of Eastleigh to our school. She came to present our Year 2 children with their Civic Award certificate. 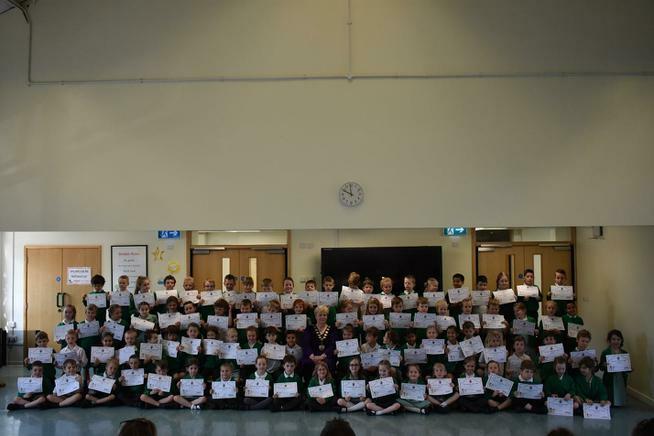 The children who completed the Civic Award had been working on their citizenship skills by taking on responsibilities at home, at school and regularly participating in a club or hobby outside of school. The children were proud to shake hands with the Mayor, share their success with the adults who came to the assembly and take their certificates home. The children will be meeting to discuss and plan the final part of the award in the coming weeks and it will be completed later this term.